If you’re sick of ridin’ dirty on these city streets, it’s time for a sea change – or in this case, a river change. We’ve taken to the water to lock down an unspeakably toight Brisbane foodie (and drinkie) ferry crawl perfect for any occasion. Well, water you waiting for? Byblos? Go on then. No really, grab a “go on then” cocktail and share a trio of dips with your creepy crawlers (needs work), as you stare past the palm trees, deep into the sunset, wondering how many more stops you can handle before needing a nap (maybe a cheeky lil one here will do). E’cco luxury, budget prices. The Terrace is e’cco’s relaxed outdoor dining space that, and you might want to sit down for this, offers $1 oysters for Happy Hour. For shucks sake, grab as many as you can and get back on the ferry before anyone notices that the weekend’s supply of oysters have mysteriously gone missing. Might want to bring a large scent-proof purse. Roll in on the river to Mary Mae’s for gorgeous views and Brisbane’s latest and greatest eats. 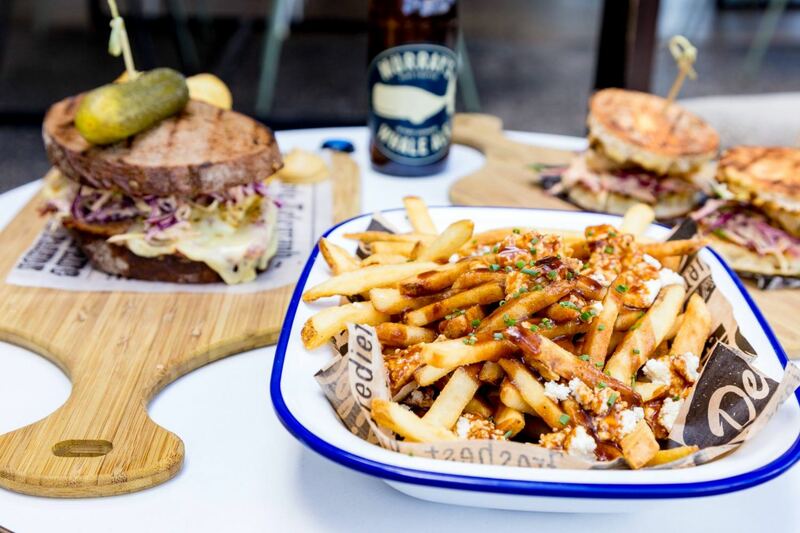 Having recently replaced WATT, this refreshed Powerhouse space is proudly pumping out the likes of poutine, buttermilk fried chicken with toasted muffins, bbq sweet sauce, aioli, chili caramel and slaw, and French dip pork belly sandwich with soft onions, chips and gravy. Grab a Hippity Hoppin’ Mary cocktail before you skip on to the next stop. Still with us? God speed. Riverland is Eagle Street Pier’s answer to a little bit of sipping and socialising made easy. With five individual kitchens, you can kick back with loaded fries, wings or calamari as you cradle a much-needed espresso martini to give you strength for the next stretch (praying to great Brown Snake might also help). When in Germany… in Brisbane. No, you haven’t gotten sea madness, it’s Oktoberfest all year round at Munich Brauhaus. Chicken dance, prost and pork knuckle down as you near the end of your legendary ferry crawl. The grand finale, the closing ceremony – you’ve made it. Crawl into the dark, underground confines of The Walrus Club, where you can sleep easy at this speakeasy. Finish your night of all nights with a signature cocktail and let the smooth jazz take you home (or an Uber, yes, that’s enough river running for today). - the gourmand who is ferry tired.